Niverville - Deliver: Clinton,Ok - Reload: Ponca City,Ok. Deliver: Calgary,Ab. - Reload: Lethbridge,Ab. Vermillion, SD.-Clinton, Ok.-Seibert,Co.-Billings, Mt.-Calgary, Ab.-Moosomin, Mb. Old School Look : Bumper-lights-visor-stacks-flat top and spread-axle fridge. Old Cabover : Left to rot on a hillside by Interstate 70, Colorado. Ex-Army 6x6 working as cross-country pole-truck in Colorado. Eight-Axle Kenworth rig at the Montana/Wyoming Port of Entry. TMC ; Southbound on Interstate 25, Wyoming. British Army trucks from CFB Suffield, Alberta. Very few Cabovers are company trucks : Most are O/O. The Search for Cath In Canada. Niverville - Deliver : Irving, Texas. Reload : Tulsa, Oklahoma. - Nivervlle. 4212 km. - 6 days. Kenworth Aero Dyne in Red. Kenworth Aero Dyne in Blue. Twelve Axle Double from South Dakota. Seventeen Axle Side Dump Gravel Train. Donkey Engines waiting for paint at Arrow in Tulsa. Tulsa, Oklahoma, once the Oil Capital of the World. Old Mack Water Tanker keeping the dust down. Natural Gas Powered Trucks at Irving, Texas. Burnt out fridge trailer still diesel tank intact. Strange. To much Helium in the steer tyres. An Autocar in the line at Tonkawa. 1928 Fageol : from the same factory that made Peterbilts 11 years later. Flying Eagle #41 : The new addition to the fleet. Niverville-Deliver: Springfield, Mo.+ Evansville, In. Pick-ups: Hebron,Ky + Lafayette,In + Waupaca, Wi - Niverville. 4646 km. - 5 days. Classic Old School Stainless-Steel 48 foot Spread-Axle Fridge. European-Look of Box-Van Pulling Freightliner Argosy. Tennessee Kenworth Cabover in the evening sun at Demotte, Indiana. Clean and shiny Kenworth with Spinners on the Drive-Axle Wheels. All-Enclosed Western Star Car-Transporter looks a real handful. 3 piece Chicken Tenders + Biscuit + Coleslaw + Dipping Sauce + Iced Tea. The "Look" : Tangerine and Burgundy Long-Hood 379 Flat-Top Peterbilt. Four Dodge [Mercedes-Benz] Sprinters on Argosy Transporter. Cut-Up from both sides-Pity they just missed each other. Old Freightliner, on for Keystone, Ile de Chenes, Manitoba. 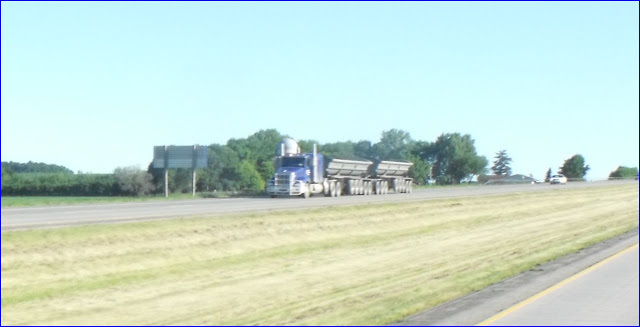 Load-Portage La Prairie/Deliver-Grinnell, Iowa/ Reload-Ottumwa, Iowa/Back to Niverville. First Year at Flying Eagle : Monthly Stats for #31. Niverville-Gonzales,Tx-La Porte,Tx-Niverville : 5407km. : 6 days. Watt big tyres you have, Stewart. Long load under cloudy South Dakota sky. GMC Brigadier with it's own shady spot. Autocar at rest in an Oklahoma truck graveyard. International Transtar in front of a couple of Fords. Lonely GMC Astro beside an Oklahoma turnpike. No Headboard, No Headache Rack and Back Door for any incoming load.